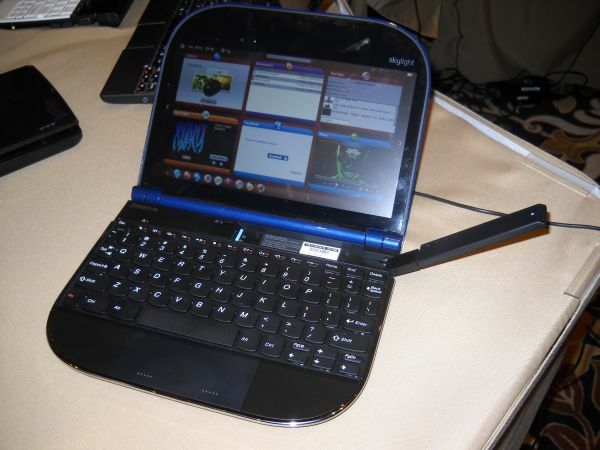 While new Atom-based Windows netbooks did show up at CES 2010, the Wintel mobile PC platform so omnipresent only a year ago, got way overshadowed this time around in a blitz of announcements around Linux-based smartbooks, e-readers, and tablets running on ARM processors. Some of the ARM-enabled netbooks on display, such as Lenovo's Skylight (pictured above), are outfitted with Qualcomm's Snapdragon chips. Plastic Logic's Que e-reader uses ARM processors from Marvell. Freescale, another ARM chipmaker, rolled out a reference platform for a sub-$200 tablets, also during the 2010 show. Moreover, Nvidia showed five tablets based on its ARM-based Tegra chips, varying in form factor and OS among vendors. ICD Vega's Tegra tablet runs Android, whereas Foxconn's runs a custom Linux distribution, for instance. But meanwhile, LG unveiled its first ever netbook, choosing Intel's Atom and Microsoft's Windows XP as the underpinnings. LG is also giving lots of thought to smartbooks and mobile gadgets in other shapes and sizes, said LG VP John Taylor, speaking with Betanews at CES 2010. "There are going to be lots of different mobile devices, and they'll differ in size as well as [level of] Internet access," he predicted. "But right now, Windows netbooks are where the customers are, and netbooks are a great launch pad for LG," Betanews was told. Fujitsu also kept up the Windows tradition with both its third-generation netbook and fourth-generation ultra-mobile PC (UMPC). Both represent a move from XP to Windows 7, and both run on Intel's Atom, said Paul Moore, senior director of product management for notebooks and tablet PCs, in an interview at CES. Atom turned up in other places aside from netbooks, too. AOC, a major computer monitor OEM nows expanding into the PC and e-reader spaces, showed an all-in-one PC running on Atom (below). But with its second all-in-one PC, the M222T, AOC will replace Atom with Intel's faster dual-core Core 2 CPU using the new Socket P, originally intended for mobile form factors, noted Jimmy Shih, director of business development for AOC's CE division. On the ARM side, Plastic Logic's entry into the suddenly crowded e-reader market carries a hefty price tag of up to around $800. But the Que uses a plastic rather than a glass screen for "unbreakability," contended Plastic Logic CEO Richard Archuleta, speaking with Betanews during the Showstoppers press event. Plastic Logic's e-reader is also specifically designed as a "business e-reader," with support for formats such as Windows PowerPoint, he elaborated. A total of 40 devices are already using Qualcomm's Snapdragon. Yet only some of these are already commercially available, while others are still under development, noted a Qualcomm rep during Pepcom's Digital Experience. Moreover, of these 40, only two Snapdragon gadgets are smartbooks, whereas the others are smartphones, he admitted. Despite having made appearances at the show all week, including during Qualcomm's Thursday afternoon keynote, an executive in the HP booth denied any actual product plans in a smartbook direction on the part of HP. Instead, a deal signed between HP and Qualcomm was limited to the creation of a Snapdragon demo unit, he said. Actually, HP's smartbook demo unit looks rather similar to the Windows 7 "slate" tablet PC, also devised by HP, which was announced by Microsoft CEO Steve Ballmer during his keynote at the event. But the demo unit developed by HP and Qualcomm runs Android instead. In contrast, Lenovo's Snapdragon-based Skylight smartbook runs a custom Linux distribution from Thundersoft. The Qualcomm rep described the Skylight as "the ultimate multimedia Internet connectivity device." Yet both Lenovo -- a maker of Windows and Linux netbooks -- and Qualcomm are clearly hedging their bets. Unlike Windows netbooks, which run Windows applications, smartbooks are aimed mostly at folks who merely want surefire Internet connectivity for browsing, e-mail, and Web apps. But at the same time, the Skylight affords a lot more multimedia storage than current smartphones -- and unlike a smartphone, Lenovo's smartbook comes with a full QWERTY keyboard for easier texting and data access, Betanews was told. Moving further into 2010, it wouldn't be at all surprising for ARM to start appearing on more smartbooks and other PC devices -- along with more smartphones -- especially considering Marvell's announcement at CES of a new quad-core ARM processor. But given Microsoft's commanding lead in the netbook market -- and its newer interest in Windows 7 "slate" form factors -- it remains to be seen how much traction the still highly fragmented Linux/ARM contingent can gain against Windows in gadgets any larger than smartphones, a segment where Microsoft's Windows Mobile OS continues to lag behind.